SLR Cameras are designed and developed for the basic requirement to see precisely what we are going to record or shoot on the film. SLR stands for Single Lens Reflex. This design is so immaculate in performance with unmatched features, that they are the first choice for professionals and serious amateurs. The same mechanics is used in DSLR (Digital Single Lens Reflex) also, where the film is replaced by the digital image sensor. The design is complicated, expensive and difficult to repair but offers a unique advantage - what you see is what you get. 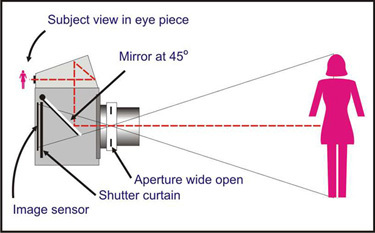 A mirror is placed at 45 degree between the lens and the image or film plane. This mirror reflects the preview of an image to the eyepiece. At this time, the aperture of the lens remains wide open for a bright view. 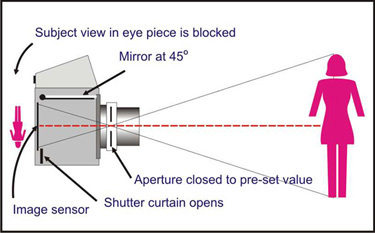 When we press the shutter release button, the aperture closes down to pre-set value, mirror swings out of the path of light, shutter mechanism operates at pre-set time to expose the image, mirror drops back to its original position and aperture opens up back to its widest open position. This whole sequence is completed in a fraction of a second. And that is the reason why the camera is complicated in design, bulky, noisy and expensive. SLR - DSLR offers unlimited choice of lens and other optical attachments, that can be used on the camera. We can use a tele lens or a wide angle lens, and it will show the exact framing and composition. If we put any optical filter on the lens, or use any additional optics on or between the lens and body, the effect is readily visible. However, apart from these disadvantages, SLR cameras are versatile equipment for photography.